Do Something Out of the Ordinary — Give Oliver's Candy! Oliver's wants you to consider us as a major source for all your gift-giving needs to your employees, clients, friends and associates. Whether it's a special occasion, an anniversary, or simply a way of saying "Thanks for doing business with us," you'll be hard pressed to find a better and more memorable way to keep your company name and image in front of valued employees, important customers, friends and family. Oliver's prides itself on developing Corporate gift programs uniquely designed to please your customers and meet your company goals and objectives. Every program Oliver's develops is as unique as you are. We have a number of Corporate customers doing different things. One of our car dealerships, for example, gives away a small chocolate gift every time someone buys a car. They don't tell the customer they'll be getting a gift. Rather, the dealership waits a week, then sends a "Thank You" box of chocolates, thanking the customers for buying the car and reminding them to come back for service. The car dealership that uses this custom designed program is getting a lot of return visits for service! Some companies provide us with customized greeting cards they produce in-house and ask us to ship the cards with every gift box of candy we send out. Other companies simply fax us a list of people who should receive candy gift items along with the desired price and product range. We take care of everything else, including insertion of customized gift cards with each box of candy and automatic shipping. We can even do private labeling for our Corporate customers. This a great way for a company to project its own image and strengthen its identity with customers and prospects. Call or e-mail us for more information about this service. Oliver's has developed corporate programs for hotels that use candy baskets in all their VIP rooms. Some of our travel agent customers use our candy and gift items as "give-aways" to couples making honeymoon travel arrangements. These are just some of the ways our Corporate customers are using our products. The ideas are endless! 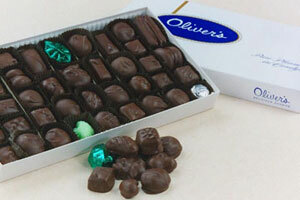 Oliver's Candies have been a valuable sales tool for First Choice Travel! All our cruise clients receive a fabulous gift basket that has been especially made for us! This is always well received and leaves an indelible impression, unlike a bottle of wine many months later in the ship. Our sales representatives use the chocolate thank you cards and mini candy baskets on sales calls. It's a wonderful way to make a great first impression! Mixing business with pleasure is a great combination with Oliver's Candies! There is no better way to promote your corporate identity than to give away gifts with your name on them. Send customers and prospects a chocolate business card, your logo or delicious chocolate replicas of the newest addition to your product line, and you'll have them talking you up to everyone they meet! Customers really appreciate — and look forward to — receiving our delicious, mouthwatering chocolates. 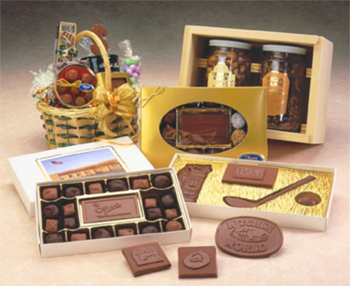 They will appreciate you for sending them such a high quality, indescribably delicious gift. You can be sure they'll spread kind words about your company to their friends, family and associates.